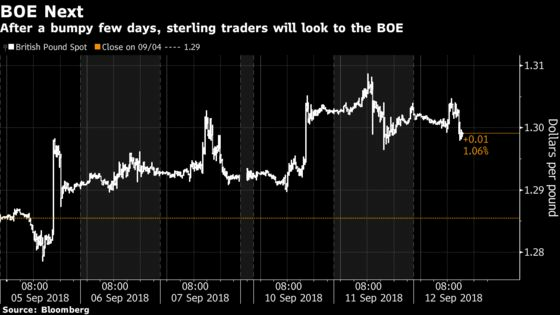 (Bloomberg) -- The pound’s fortunes are being dictated by Brexit and signs of optimism over a deal could lead to a more hawkish-sounding Bank of England driving the currency higher. Market bets on further BOE policy tightening have receded in recent weeks following August’s quarter-point interest-rate increase, with the next hike not fully priced in until the end of 2019. While this could signal a non-event at Thursday’s BOE announcement for sterling and gilts, there is a risk that current market thinking could prove too dovish. The pound found some support earlier in the week on better-than-expected U.K. economic data but has since been whipsawed by conflicting Brexit headlines. The currency struggled to hold above the $1.30 mark Wednesday. European Commission President Jean-Claude Juncker rejected the U.K.’s plans for Britain to stay in “parts” of the single market after it leaves the bloc, but said he would work “day and night” for a divorce agreement.